When it comes to nifty kitchen utensils and gadgets, a good quality cheese grater may not be top of your list of exciting new purchases to make. However, if you have an old grater in your cupboard that's been serving you well for years, you might just be surprised at the difference a new grater will make to your food prepping. If you find yourself forcing your block of cheese through your grater only to create a mush on one side and heavy, chunky strips of cheese on the other side, you may well benefit from an upgrade. So take a look at our top five graters to get you started in your hunt, and keep an eye out for your favourite brands such as Joseph Joseph and OXO if you are keen on buying a grater that matches the rest of your kitchen gadgets. By the way, graters make great Christmas gifts for foodies, so why not check out what else you might want to get them once you've chosen the best grater? What to look for when buying a grater? The best cheese grater will have sharp stainless steel blades and will enable to you lightly press cheese against the blades and require a relatively effortless up and down motion. Sadly, with most graters, the blades cannot easily be replaced, so buying a new one every year or so is the only sure-fire way to guarantee sharp blades and easy grating. Essentially, the sharper/newer the grater, the easier it is to use. So, other than ease of use and that sharpness of the blade, what else should you be thinking about when looking for the perfect grater? It is largely down to your households needs. Are you looking for a no frills box grater that simply grates cheese at different thicknesses? Classic box graters typically have four sides designed to grate cheese thickly or thinly, finely grate harder cheeses like parmesan and create easy square slices for sandwiches. Perhaps you see yourself as a bit of a Gordon Ramsay, in which case you may want to step it up a notch and consider a grater that also incorporates a microplane to make ingredient preparation and meal decoration more efficient. Microplanes are incredibly handy for grating lemon zest, chocolate and even garlic, to ensure small flakes of grated ingredients that are easy to distribute. They are also handy if you are watching the calories as they grate a finer dusting of cheese compared to a regular grater. If you’re looking for a nifty item that allows you to grate one item then slice another, there are plenty of gadgets that cater to simultaneous cheese grating and potato slicing. Plus, you can get graters with interchangeable blades that can even create ribbon vegetables as well as slices of cheese making them a handy versatile kitchen gadget. Households grating cheese en masse for family sized lasagnes may want to consider a grater that catches the cheese in a box, these are great for anyone who lets the kids help out with dinner prep as it saves on mess. Need more stuff for your kitchen, as well as the grater? Check out our other kitchen buying guides, from best wine openers to best orange juicers. Let’s start with this great all-rounder. Aside from being prism shaped, it performs exactly the same as an ordinary box grater but because of its bigger base you can be super organised. For example, if you want to prepare enough cheese for the week’s worth of sandwiches ahead, simply grate away then remove the container and pop it straight into the fridge. The container also prevents bits of cheese from escaping onto the kitchen counter, avoiding a clean up operation that you could certainly do without. For convenience purposes, this one is a must. This grater from OXO, is another great all-rounder. In fact, it’s fairly similar to our number one product, just a little cheaper. With a rubber bottom and handle, the risk of a slip up is greatly reduced, which means nails and finger tips should stay intact. It also comes with a container, which has handy measurements down the side so you can keep an eye on how much of an ingredient you’re preparing. The only downside is the container isn’t as large, which means putting your week’s worth of grated cheese for the kids’ sandwiches in a separate tub. If you like to keep your kitchen organised and the thought of multiple gadgets for different cooking chores is your worst nightmare, this multi-functional grater and slicer might be just what you need. All you need to do is select the kind of blade you require and insert it into the device. There's a straight slicer for cutting thin potato chips, a fine grater which is ideal for grating garlic, a Julienne slicer for spaghetti veg and a regular grater for cheese. With the added bonus of the box base which catches your grated food, this is a pretty nifty kitchen item. Slicing small ingredients like radishes or that last nub of ginger can sometimes feel like a finger-risk operation; but with this handy Joseph Joseph grater, simply pop the small item into its little container, place on the lid and slide it up and down until there’s nothing left to slice. 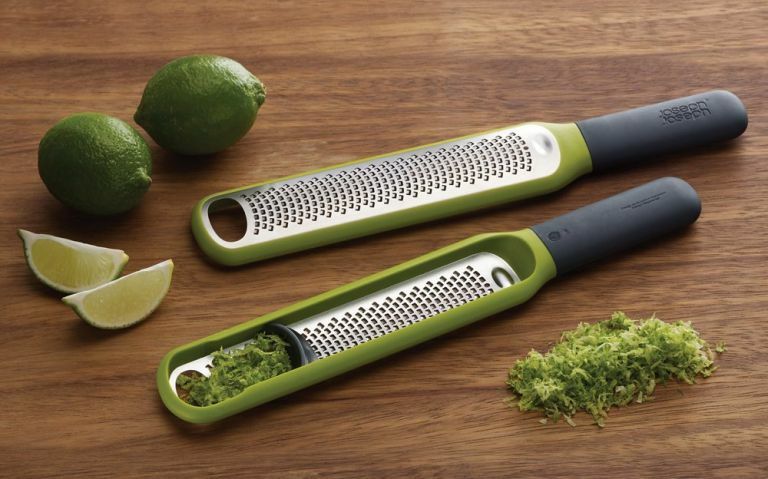 Alternatively, for removing the zest off larger items such as limes, or if you want to microplane cheese you can use the device without the container, which makes this grater completely multi-functional. Combining safety with efficiency, this is a great buy for any kitchen drawer. If you love to experiment with the latest gourmet recipes or often find yourself annoyed that your classic silver box grater doesn't have an 'in-between' size for cheese grating, this grater is the perfect choice. Firstly, Cuisipro have stepped it up a notch to include two additional sides, offering you six grating options and allowing you to refine the way in which you grate your ingredients. Secondly, the patented design has been optimised to allow you to grate even the largest of quantities as efficiently as possible. While the price is certainly more than the others featured on our list, the quality speaks for itself.